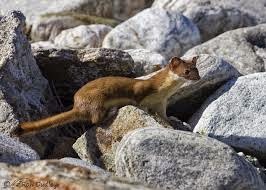 Cerita Inggris Indonesia: The Rock and the Weasel - Long ago a weasel came to a forest near Phakchong. He saw many mice there. Weasels like to eat mice, so the weasel decided to stay in the forest. First, the weasel found a place to sleep in a hole beneath a bush. The next day he walked to the top of a small hill. On the hilltop was a rock. The weasel decided to sit on the rock. The rock sighed, for there was nothing he could do. The weasel sat back on his hind legs. He raised his forelegs in front of him, looked at the sky, and pretended to pray. At sunset the weasel walked down the hill to his home. He did the same thing the next day, and the next day, and the next day after that. Soon the mice became curious about the weasel. They watched him for several days. Finally they chose one brave mouse to ask the weasel what he was doing. The brave mouse climbed the hill. “What are you doing?” asked the mouse. “I’m praying,” replied the weasel. The mouse ran back down the hill. He told the other mice that the weasel was praying. The mice decided that the weasel was a very great animal. They also thought he must be a very good animal. That evening they waited for him at the bottom of the hill. “We want to pay our respects’ to you,” said their leader. The mice walked around the weasel three times. Then they went home. They did not notice that one mouse was missing. Each night after that the mice waited for the weasel. Each night he came down from the hilltop. Each night the mice walked around him three times, and each night the weasel ate one mouse. This went on for several months. Finally the leader of the mice noticed something. The forest had fewer mice than before. He called a meeting of all the mice. “Something is wrong,” said the leader. “Mice are disappearing, I thing the weasel is eating our friends and relations. The mice decided to look at the weasel’s home. They went the next day, while the weasel was on the rock. In the weasel’s hole they found a large pile of mouse bone. The mice ran back to the leader who told them what to do. That evening most of the mice waited at the bottom of the hill. Some of the stronger mice walked up behind the hill. At the sundown the weasel stepped off the rock, and it began to move. The rock rolled down the hill, but the weasel didn’t hear it coming. He was thinking about his dinner. The rock landed on the weasel.